EDIT: I retried this generically, and see the same problem. To reproduce, follow my steps below. I am starting to think that it might be a problem with the hardware, but I am not certain. When installing a CentOS 7 ISO using kickstart, I get an error saying "Pane is dead" with no additional logs. Basically, I take the CentOS 7 ISO and added a kickstart file. When installing with this on VirtualBox, everything works fine. When I attempt to install it on real hardware with multiple interfaces, I get the "Pane is dead" error after all the packages are installed. There are no logs generated that indicate the problem. I've even added the logging --level=debug line to the kickstart, but there was nothing of value to see. There is no post-installation step (I removed that from the ks since that is last log before the problem is seen), so that cannot be the issue. I did see somewhere on the web that someone said there is a difference between CentOS 6 and 7 ISOs, but there was no additional information to indicate quantitatively what those differences might be. Here are the complete instructions on how to reproduce. If you can see what I am doing wrong, I would greatly appreciate it. My production machine is an up-to-date CentOS 7 server. If you are missing any applications, I am sure you can install them easily with yum. I copied all the files out into a working directory. Note: If using these instructions and cutting and pasting, you may get "> " prefixing every line. Use the following to remove them. I've tried to limit the number of packages installed, hence all the exclusions in the %packages section. Next, edit my isolinux.cfg file and add inst.ks=cdrom:/dev/cdrom:/ks.cfg to each append line and make the non-test version the default. This takes a few minutes to complete as it downloads all the packages. Creating the repository is a simple task. It turns out that the problem was with the lang en_CA.UTF-8 line in the kickstart file. I changed this to lang en_US.UTF-8 and the installation completes normally. I may ask another question on how to use en_CA but at least I solved this one. 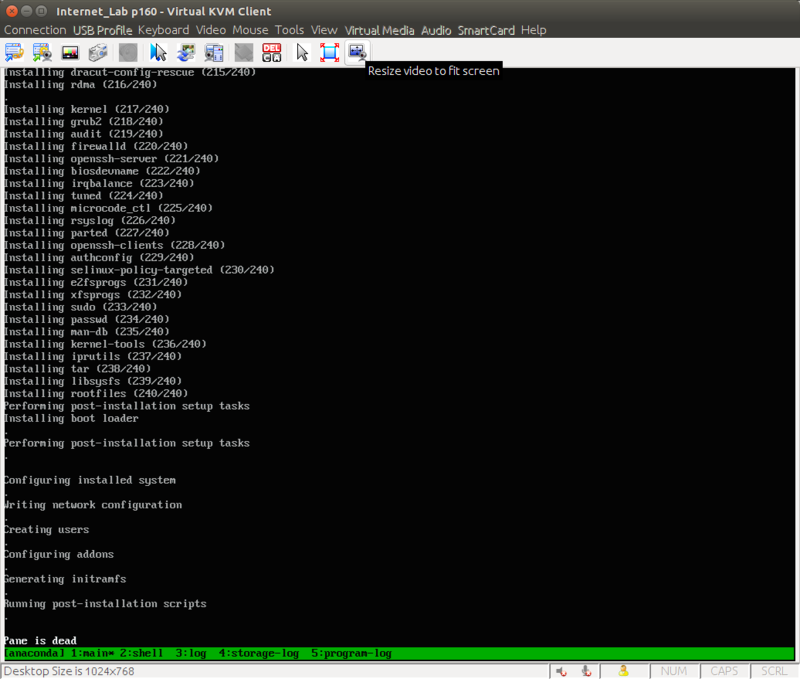 During anaconda installation, I configured minimum installation over the network. I copied this file off and used it exactly as my own template for the my ks.cfg file. I also re-created the Packages and repodata directories based on the set of installed packages in this installation. Created a new iso with the new kickstart file and installation worked! Line by line, I changed the differences in the new ks.cfg file to match the old (problematic one), recreated the ISO and attempted installation. Painfully found that the only line that caused the error was the lang en_CA.UTF-8 line. The issue seems to be quite clear as I might say. Notice that the Pane is dead comes when the post-installation script runs. I'd rather cut that section from ks file or even better log it to understand what exactly went wrong. In order to log you can use --log /path/to/logfile directive in your kickstart. Once you got pane message just switch to one of TTYs and check the logs. So the offending section is %post. Not the answer you're looking for? Browse other questions tagged linux centos7 kickstart iso or ask your own question. kickstart ks.cfg: Where should `url --url` point?